We thought we'd lost him. Worry bear. A month or two ago, one of my twins seemed to need some extra support at preschool in a few areas...in terms of feeling anxious and not behaving himself. When I was in high school, I'd had a dear friend (still a dear friend, in fact) who also seemed worried a lot. 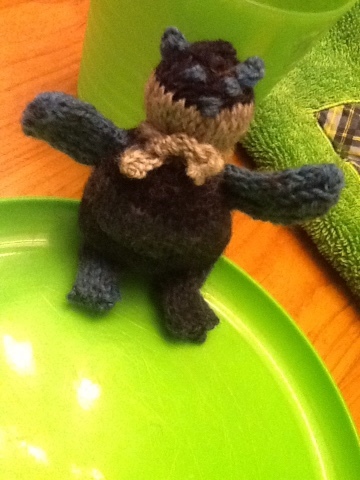 I made him a special felt bear, maybe 2 inches (5cm) tall, that fit in his pocket. You could stick your hand in your pocket, touch your bear, and feel reassured...and although I still have that sewing pattern somewhere, it is small and fiddly. I remember it being fiddly when I was a teenager, with all the time in the world. It was clear I needed to make another one, and fast. I grabbed some size 3 (3.25mm) double pointed needles, some Rowan Pure Wool dk, some wool stuffing...and voila, worry bear was ready by the time preschool was over that day. Since then, worry bear has had a few accidental trips through the wash---thank goodness for superwash wool! He is a bit smaller, and a bit more worn, but fine. Until last Sunday. On Sunday, the professor took the twins to their dance class. I got to attend an adult ed. class...by myself--an hour and a half of learning, knitting, and pure joy, let me tell you! When everybody was back home, I noticed that one twin was wearing the other twin's sweatpants...and at the end of the day, we found we'd lost worry bear. OH NO! We made it through one day of preschool without him. I applied myself to the task, using some of the new sock yarn from www.yarncanada.ca. Tuesday morning, worry bear #2 was waiting at the breakfast table. There were complaints. He was not just the same. He was bigger. Squishy. (He had not been through the wash several times already!) However, he hopped into a twin's pocket. All seemed well. I raced around doing chores for a bit, and vacuumed. Guess what? Worry Bear #1! We found him! He was just resting under the couch for a while....I guess vacuuming has some benefits after all! 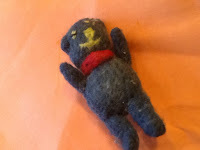 At the moment, Worry Bear is just something out of my head, no pattern, no design forthcoming. I did do Lambie and Doggie years ago, and they could be easily sized down with smaller needles and lighter weight yarn...but for now, Worry Bear is something we need here, at least in one four year old's pocket, so I will have to turn them out upon request. Let's hope Worry Bear #2 is a good back up. Just in case something goes missing again...which it is bound to, sooner or later! In the meanwhile, I am just finishing up knitting the second twin sweater, and then it is on to more mitts, and wool socks. We seem to have outgrown a lot of our socks...and it's finally snowy and colder today! Maybe winter is really here now? Two adults have already commented to me today, "Nice Snow!" or "It's snowing!" with glee. We enjoyed the warm fall but snow a month late? We were missing it, I guess. It's Snow Time, indeed! Remember these mitts, the ones that came in various shades of purple, and just a stripe of gold, and that I finished maybe 2 months ago? Oh yeah, those? We've had a warm snap here, something unheard of in December. The above freezing temperatures and sunny days all combined to create perfect tobogganing and playing outside for preschoolers. The most fun on earth is to pile a bunch of 4 year olds in an old plastic kiddy pool (no kidding) and slide down the hill behind the school. The hill is man-made, since we live on the prairies, so there are no trees in sight. Perfect. After I carefully rinsed (no agitation here!) those mitts about 8 times, I realized the water had been dirtier than most fleeces I'd ever washed. Also, I observed that the mitts were remarkably small. By the time I got the whole story out of the four year old, I'd long since realized that the mitts were felted and....toast. They will probably keep an infant's hands warm, but only if I do some serious triage first. Oh well. So, we're in the middle of Hanukah, and this is a low-key gift holiday. Lots of candle lighting, sweets, singing, dancing, and fun. Yeah, you maybe get some big toys, but some nights? you get Mommy's handmade mitten liners. 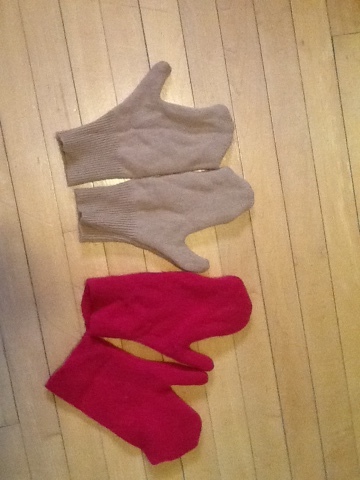 I took a pair of mitts that still fit, cut this out of recycled sweaters, and used the sewing machine.... Top one there is beige cashmere (less prone to felting than wool) and the bottom one is red, already felted, wool. I do need to make another pair of mitts for the mud pie, felting mitts twin, but in the meanwhile, he can wear the back up mitts. (back up, acrylic mitts were knit by somebody who is friendly with my mom.) If it gets cold enough, now we have liners to make those work. The thing is, I've had a bit of a backlog in the knitting department. Still working on sweater #2, and after that, I have to make some (superwash wool--no felting!) mitts, but wanted to mention this first. 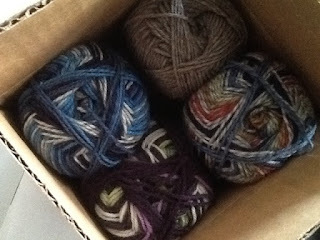 I got a lovely package in the mail from www.yarncanada.ca. It's some Patons' Kroy sock yarn. They've got a stunning range of colors available, more than I would ever get to see at a big box retailer. This is good solid wool yarn, with a bit of nylon to help make for hardwearing socks. I'd ordered these colors for my boys, and they were thrilled by the selection. However, they are not sure they want socks, they are showing more interest in having me knit up some worry bears for their pockets. (little knit amigurumi bears, to hold onto when you are having a worry.) Bears are waiting their turn in the knitting line up, but I've already heard from certain four year olds that the variegated blue at the left of this photo and the purple one, beneath, are the appropriate colors! I know a lot of knitters would freak out if somebody went and ruined their work 2 months after they'd made it. You know, played mud pies in the snow sunshine and destroyed their mitts. I feel oddly detached from it all. I know both my boys LOVE Mommy's handknits. They are proud to wear all the homemade woollies I churn out for them to order. So, I'm ok with making another pair of mitts...or two. I think we'll need back ups. In any case, I know that having more to make is ok because in the end? I like to knit. I like to feel valued and that my work is useful. PS: We are finally feeling better around here. Thanks for checking on us! It was a yucky, exhausting virus. 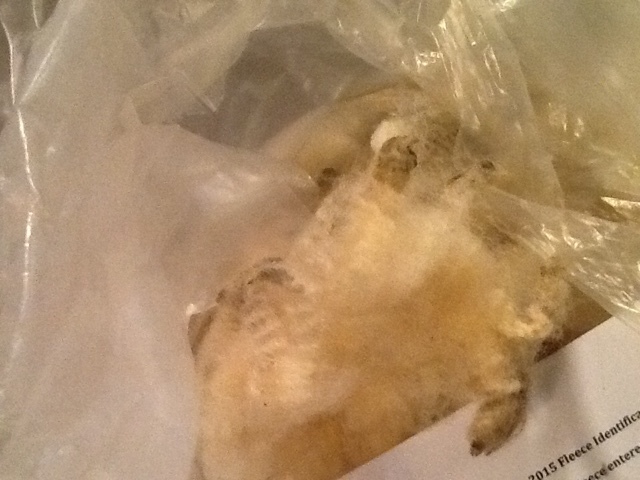 A few days ago, back when I was feeling well (more on that later), I washed fleece. I had this gorgeous fleece--waiting to be washed-- from my friend Gerry's farm sitting in my basement since June. The professor bought it for me as an anniversary gift! 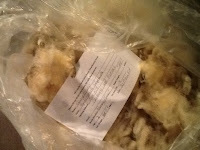 It is a Romney/Texel fleece, and according to her notes, 8.5lbs before washing. It was pretty clean, but even so, it took many trips up and down the basement stairs to wash it. I had to use the washing machine as a set tub, divide the fleece in half, each 'half' had one hot water wash and 2 rinses, AND because our hot water heater is not set to "very hot", I boiled water in my electric kettle (upstairs) to raise the temperature of the soak water. (A note on childproofing: our hot water heater can't be really cranked up because the water can't be so hot as to burn twins' fingers. Perhaps with one kid at a time, you can monitor whether or not they've turned on the hot water by accident, but with two? The fleece is gorgeous and these basement snapshots do not do it justice. Plus, taking a day to submerge my hands in fleece was really therapeutic. In the midst of all this, my CBC piece on how Manitobans can pull together to welcome Syrian refugees came out. --Another Note: Please don't click on this if you have small kids around or if you haven't already seen some of the graphic refugee images in the news. I didn't choose the photos, and these were upsetting so that I had to hide the iPad from my kids when I saw the article online. Despite the overwhelmingly negative comments on the article page, I got a lot of positive feedback as well from other sources, so I am glad it got published. In a rare confluence of fiber/knitting and social justice, Ram Wools, one of our local yarn shops, is cooperating in the 1000 stitches for Syria campaign. I discovered this group on Ravelry and wanted to participate. Basically, since Canada is welcoming lots of refugees here during the winter time, knitters are trying to work together to provide each newcomer with a handknit woolly item--a hat, mitts, scarf, etc. to help make it through the cold here. I was also thrilled to see the effort written up on the local CBC Manitoba website. Now on to the "won't" part of my post. A week or two ago, the professor and a house guest of ours both had bad colds/viruses. We tried to take good care of them and I thought we would either be lucky (hah) or it would only be a matter of time until the rest of us got sick. The professor got better, the house guest went home, and bingo! The virus didn't want to leave. 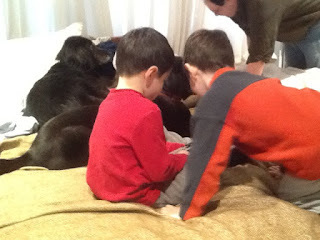 On Sunday, we were at home nearly all day with two under-the-weather four year olds. On Monday, one kid was well enough to go to preschool. I spent both Monday and Tuesday on the couch with the other kid, watching WAY more Sesame Street and Sid the Science Kid than I'd prefer. Now, the kid version of this seems to include sniffles, a cough, usual cold thing. I have a virus too, but mine is world's worst fatigue, achey, hurt, sore feeling all over. (Hint: It was so bad that I couldn't cook at all so gave everybody hot dogs, baked beans, and leftover brown rice for dinner on Monday. The boys liked it anyhow.) It was also so bad that any big ten years of blogging celebration has been scuttled. Pffft. Just like that. I'm sad about that, but seem to lack the get up and go to try to make a fuss. Have you been reading this blog for ten years? more? less? If so, say hi!? It is now Wednesday, both boys are back at school. Not all better, but getting better, and missing friends and school activities. I, however, feel so limp, tired, and hurty that I am wary of attempting much. 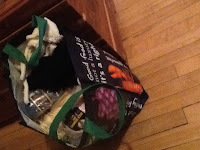 I did gather this bag of three clean and new/nearly new knitted items and a whole lot of wool or wool blend yarn for others to knit up. I want to bring it to the yarn shop to donate. My stash is so deep that collecting this only took about five minutes, and I don't feel I will miss any of it! (wow. That is saying something....) I am even giving away some gorgeous lite-lopi (I love that yarn) in an electric blue that I just cannot see anybody being willing to wear. It's a very 80s color. OK, I'm off to do some more groaning on the couch. At least it is quiet today, and I have the couch to myself. I'm trying to transport myself back to that fleece washing day, where the wool locks felt amazing and I too felt strong and able....oh well.